130 out of a possible 185 letters had to reach the fivefold mark; therefore, leaving me with only 55 extras letters to maneuver with. 80 out of those 130 letters have Scrabble values of 2 or more points. 50 out of those 130 letters have Scrabble values of 4 or more points. 25 out of those 130 letters have Scrabble values of 5 or more points. For those who didn't care so much for "JIVER" in my puzzle, here's another alternative. Joel here, writing for Will. We're happy to say yes on your QUINTUPLE pangram. Wow! What an achievement. Of course, there are some compromises here ... but really not so many. Overall, a stunt that's too amazing not to run. Tentatively, slated this for a Wednesday given all of the unusual and difficult vocabulary. Thanks for sending this to us — and congrats! At XWord Info, we track a ton of records. 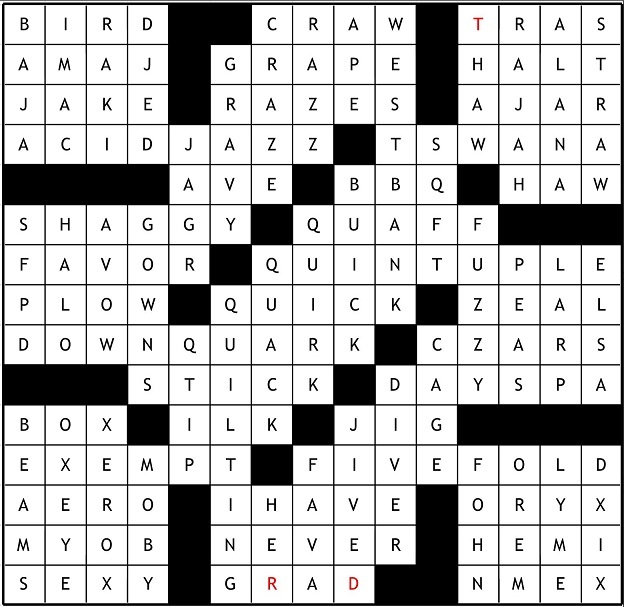 Note that Dave's name appears three times on the pangram records list now … every one of his three NYT puzzles! It was only a matter of time until the old record — two people with quadruple pangrams — got smashed. QUINTUPLE instances of each letter today. I'd say roughly 1/4 of solvers/constructors tell me they love pangrams; something so cool about that full set of high-value Scrabbly letters. Another 1/2 seem to hate them with a burning passion, citing the trade-offs in gluey fill — and gritty solving experience — that they often necessitate. (The remaining 1/4 seem neutral.) I imagine today's offering will generate a lot of strong feelings, one way or the other. I appreciate a pangram, as long as the trade-offs aren't that noticeable. Today's was amazingly smooth, given the astonishing FIVEFOLD full sets of letters. I especially liked the line of Qs across the middle, with such silky results. Okay, there's a SQFT holding the top of that section together, but that's minor. And as a lover of all things physics, I loved DOWN QUARK. And the raft of Zs and Js in the north! ACID JAZZ is a great entry, and Dave builds around it with RAZZ, CRAZE, BAJA. RAKI was tough for me to figure out, but no doubt it's a real type of liquor. Surprisingly, there was only one region that made me pause: the lower right. JIVER felt like a compromise in order to work in that fifth J — although it does have dictionary support, it feels contrived and/or old-timey to me — and then DXIX felt like a last-ditch attempt to shoehorn in the last two Xs. I had the same qualm about one of the quadruple pangrams, as using random Roman numerals feels like a pretty iffy method of working in extra Xs. But overall, the puzzle was remarkably smooth — surprisingly, more so than some of the previous record holders. Whether you love or hate pangrams, whether you love or hate people breaking records for the sake of breaking records, this is undoubtedly a meticulous feat of construction. This is the first ever QUINTUPLE pangram in the NYT. Double pangrams appeared occasionally even in pre-Shortz grids. The first triple was by Matt Gaffney in 1998. Then, Peter Wentz managed a quadruple in 2010 but required 16 columns. In 2013, Raymond C. Young squeezed a quadruple into a standard 15x15 grid. Today we have another milestone from David C. Duncan Dekker who had a triple pangram just last year. Here are thumbnails of all seven Shortz Era multi-level pangrams and for a slightly different view, here are the same puzzles with the scrabble values colorized so you can more easily see the letter distributions. This page shows pangrams organized by constructors so you can see who has been most enticed by the challenge. One pre-Shortz constructor seems to have been obsessed by them. Amazingly, or perhaps inevitably, today's puzzle destroys another record as well. It has by far the highest scrabble average of any NYT crossword. Average word length: 4.63, Scrabble score: 490, Scrabble average: 2.65.